A rather listless spy adventure, The Double is caught between a flimsy plot that leaves out all the details and tired action scenes that offer nothing new. A couple of good plot twists maintain a modicum of interest. When a US senator is suddenly killed by having his throat slit, CIA Director Tom Highland (Martin Sheen) suspects that the murder is the work of Cassius, the codename for a long dormant Soviet-era assassin. Highland calls in retired agent Paul Shepherdson (Richard Gere) to try and capture Cassius. Prior to retirement Shepherdson had led a multi-year effort to eliminate a nest of Soviet spies, and had succeeded in killing them all except for the elusive Cassius. Highland is asked to work with young FBI agent Ben Geary (Topher Grace), who wrote his Master's thesis on Cassius. Geary is obsessed with the case, and Stephenson finds it difficult to work with the eager but inexperienced young agent. They nevertheless track down and interrogate the imprisoned Brutus (Stephen Moyer), the lone surviving member of Cassius' cell, to try and determine the killers' whereabouts. Brutus is soon killed, and the emergence of another brutal Soviet-era assassin in the form of Bozlovski (Tamer Hassan) further complicates the investigation. The Double offers two significant twists, the first about 30 minutes into the film and the second in the final 10 minutes. Both of the script summersaults are sharp and unexpected, and credit to the writing team of Derek Haas and director Michael Brandt for conjuring up a crisp double. The relationship between Shepherdson and Geary also steps beyond buddy movie territory and into some moments of anguished reflection and anxiety. But otherwise, there is precious little to enjoy. The story stumbles and falls early, avoiding any depth, and skipping past details such as the background to the senator's death, Bozlovski's mission, why Cassius is being smoked out of hiding, or how Stephenson was able to track down Bozlovski for the final confrontation. The investigative skills on display bounce between simplistic and embarrassing, and finally tilt on incredulous, primarily consisting of Geary concluding that Cassius must always attend the scene of his crimes and then scouring photos to find the common face. There are a few action scenes consisting of the most mundane foot chases, exchanges of gunfire and some close-quarters combat, and it is all about 40 years out of date in terms of originality and execution. Richard Gere and Topher Grace fulfill their obligations with minimal fuss and impact, both playing their roles with notable dedication but without being able to rise above above the material. 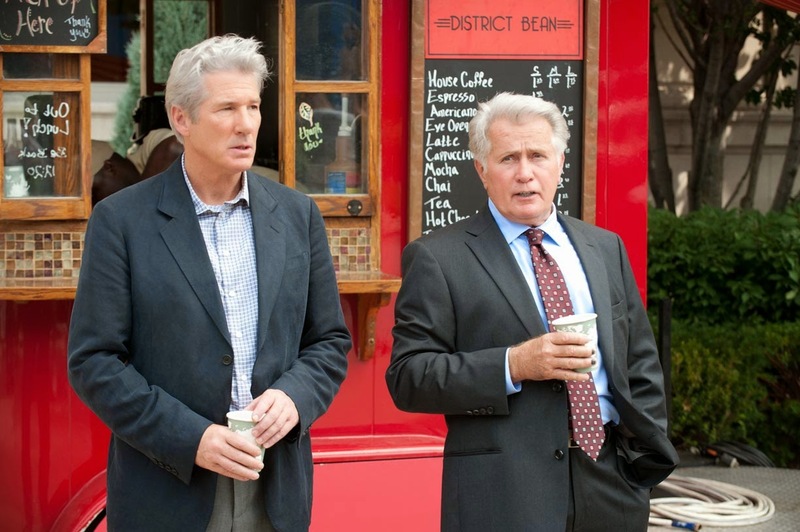 Martin Sheen breezes through the film often in the company of expensive suits and a large overcoat, throwing his authority around and serving as a reminder than most movies improve when he is given more screen time. The Double offers a pair of intriguing jacks, but also serves up a series of frustrating double faults.